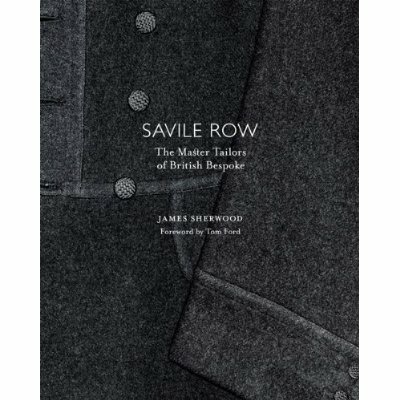 UPDATE: The current edition of Savile Row has been exhausted, but James informs me a second edition is coming out shortly. James Sherwood’s latest book has been out for a while, but I like to wait and review a book once I’ve actually read it. And it’s still available, indeed reduced from £45 to £36, on Amazon. That hefty price tag is justified by sumptuous production. The Master Tailors is a real coffee table book – something that will have you poring over the weave detail on big, full-page prints. It makes you realise the weight of Cary Grant’s flannels, brings out the fineness of a pearl-stitch buttonhole and allows you to appreciate the spray-on tightness of Prince Eddy’s full dress uniform. Even without buying the book its scale of illustration should be obvious from the flannel greatcoat on the cover with its black, silk-covered buttons. But this should not be mistaken for a contemporary book, or a practical one. While it is detailed and entertaining throughout, Master Tailors is at its best when explaining the history of different house and the customers that frequented them. The level of research and factual depth is impressive, but then that isn’t surprising from one so buried in the archives of the Row’s institutions. It should not be used as a guide to Savile Row today, or the practical choice of where to have a suit made. But the history does inspire you to join the ranks of movie men that frequented Anderson & Sheppard, or the navy men that went to Gieves & Hawkes. Indeed, the most impressive thing about the writing might be that it remains consistently enjoyable, despite the necessity to be structured as two dozen potted histories. One way this is achieved is by dropping in pieces of social context, such as the fact that Idina, Countess of Erroll’s being measured ‘astride’ at Huntsman is a little ironic given her reputation for promiscuity. This is certainly the best of James Sherwood’s books on Savile Row. It should be purchased if you are planning to buy a suit there and want to build up the excitement; if you have no plans to do so, it could be rather frustrating. You can follow the discussion on Book review: Savile Row, the Master Tailors of British Bespoke by entering your email address in the box below. You will then receive an email every time a new comment is added. These will also contain a link to a page where you can stop the alerts, and remove all of your related data from the site. Just placed my order, speaking of which, what would you say then, Simon, is a “practical book” on how to choose where to have a suit made? Is this the same book as “Bespoke: The Men’s Style of Savile Row” by James Sherwood? Is one the US edition and the other the UK version? If so, any differences in text or pics? Good point. Flusser, Boyer and indeed my upcoming book (A guide to tailoring, Le Snob series) are more practical books to buying clothes and dressing well, but there is no practical guide to selecting tailors. Often because few men have tried them all. Same book. As far as I am aware, no difference inside, just a different cover. Est-ce que ‘upcoming’ un autre mot est pour ‘forthcoming’ – [prochain]? Bravo! M. Crompton! That goes for this blog, The Rake, and pretty much any other quality source dedicated to the best of sartorial pursuits. As you say, it is a very good policy to review a book only after you have read it. Cheers.